The hotel offers a restaurant and a snack bar/deli. A bar/lounge is on site where guests can unwind with a drink. This 3-star property offers access to a 24-hour business center. Public areas are equipped with complimentary wireless Internet access. A roundtrip airport shuttle is complimentary to guests at scheduled times. Parking is available onsite for a surcharge. Situated near the airport, this hotel is 1 mi (1.7 km) from NATO Headquarters and 3 mi (4.8 km) from Cliniques Universitaires Saint-Luc. Train World and Place Charles Rogier are also within 6 mi (10 km). Machelen Diegem Station is 14 minutes by foot and Haren Station is 25 minutes. This hotel features a restaurant, a bar/lounge, and a snack bar/deli. Free WiFi in public areas and a free airport shuttle are also provided. Other amenities include a 24-hour business center, self parking, and a 24-hour front desk. All 98 rooms offer free WiFi, premium bedding, and flat-screen TVs with cable channels. Other amenities available to guests include hair dryers, showers, and phones. 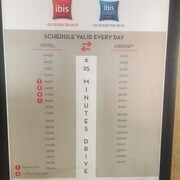 Ibis Brussels Airport offers 98 air-conditioned accommodations with hair dryers. Beds feature premium bedding. Flat-screen televisions come with cable channels. Bathrooms include showers. This Machelen hotel provides complimentary wireless Internet access. Business-friendly amenities include desks and phones. Housekeeping is provided daily. Restaurant - This restaurant serves breakfast and dinner. Open select days.